Tear gas used on border crashers! Wuuuuuuh? I thought the msm said the invasion wasn't an invasion?? And that all that was just hype for the midterms?? I'm shocked?? They are crashing the border right now, making women and children go first..
Damm, Trump was 100% right again...or maybe they are just actors ? Who knows,, maybe we should ask Acosta what it's called now? Re: Tear gas used on border crashers! How many caravan illegals got into our Country illegally?? That's what really matters here, imho!! None should get in. Just load them in choppers and fly them back over about 30 miles in. -- and then kick them out at about 5,000 feet! Women and children first right? You are a POS. GRT, The only upside here, the old crusty over the hill narrow minded dudes will die off before you, and the hope is things can be salvaged by those behind them. I don't see any hopeful epiphany's on their part on the horizon, unfortunately. When criminals break and enter a home, intending to live in it, we catch them and send 'em to prison. It would be even worse if they bring their kids along. Not only are they criminals, they're unfit parent(s). Of course the kids get taken by Child Protective Services or whoever does that in your state. The kids don't go to prison for the crimes of their parents--they get foster care or are taken in by relatives. When criminals break and enter into our country, they should be caught, sent to prison (most of prison time suspended provided they don't re-offend) and OF COURSE the kids should be separated from the parents, 'cause the kids should not be put in adult prison. The whole works of them should be DNA tested so that they can be identified when they're caught crossing illegally the next time. If the adults have a suspended sentence hanging over their heads, there's no need to wait on a fresh trial for re-incarceration. The tougher situation is sending the kids back to their home country. It may be that there is no "foster care" system there, and their government may not be willing/able to locate relatives. Maybe Sweden or Norway will take them. Wow, lots of virtue signaling by the usual suspects . The easiest thing to do is say on here how virtuous you are and how mean and nasty everyone else is compared too "myself "
The reality is, those who trash others are usually the ones who do the least for those who need help...it's a way of making themselves feel better. Fact is those on the right are more generous of their time, money and assistant too those in true need of help. What ever happened to the sonic and micro wave deterrent devices? That is what is needed there. Heat em up when climbing the fence. And this crap about bible times does not compare. IN THOSE DAYS LAND WAS ALL FREE, AND NOT LOCKED UP BY THE UNITED NATIONS. 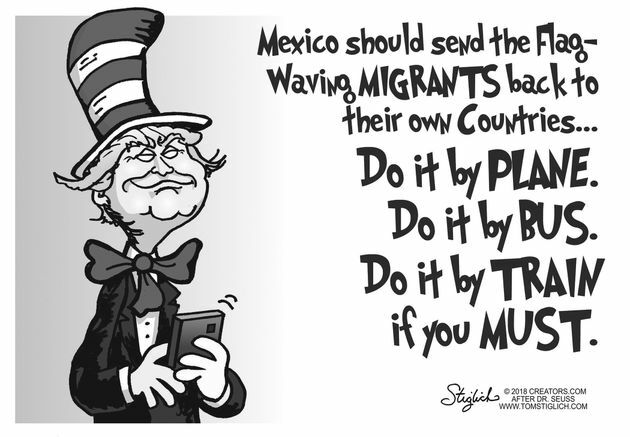 How many illegals are j-c-c, GRT, and Dome going to sponsor and take into their houses? Or are you three all just TALK? As for kids being involved. I think that in our past when aliens came to become citizens, if they didn't all come as a family that was probably sponsored, Dad came 1st and got settled in LEGALLY and then had the rest of the family come over to be with him again, LEGALLY. Not trying to, "STORM the GATE's", like these people are trying to do with Soros's and any other rich SOB's MONEY with NWO agenda's! PS., and just what do you NOT understand about the word, "ILLEGAL"? ?